Some time ago we individually started our search, to find the truth, authentic happiness and peace. Our lives have since evolved through our daily intention to live with love, an open heart and be ever present in each moment. This has brought us to appreciate the many WOWs that are available in each NOW moment! Our search was triggered by those little things we commonly brush off as stress and normal crisis that we often accept as part of normal life. Our crisis and traumas were valuable expriences and contained gifts and lessons that we can now, only years later appreciate. Our increased awareness now gives us the realisation of the many wake up calls that we overlooked / ignored / weren’t ready for when they occured. How many crises & pain does one need to wake up ? … broken relationships, cancer, demanding careers with 100 hr weeks pushing you to breaking point… to name but a few! So with many great guides and teachers, we consciously chose a different path than the one that had brought us so much pain. We were blessed and priveleged to gain support directly and indirectly from some benevolent, loving, passionate people. Some of the most significant for us being The Hoffman Quadrinty Process Team, The Path Of Love Team, The Creating Love Team, OSHO, Ananta Kranti, Chris Newell, Tracey Hammet, Dr Fred Spittel, Nouk Sanchez & Tomas Viera (Take Me To Truth), who have all shown us how to find the freeway on ramp to really start chosing the life we want and the WOWs we can appreciate in each NOW moment. We found each other in our search as well as the divinity within ourselves. There is only the NOW and we intend to dive deep into it! We hope you come share the many WOWs with us. We have been utilising sound in many forms as a part of our own daily relaxation & healing. We have had a growing connection to the Drum, Hang, Singing Bowls and various other worldly musical instruments over the past 10 years. 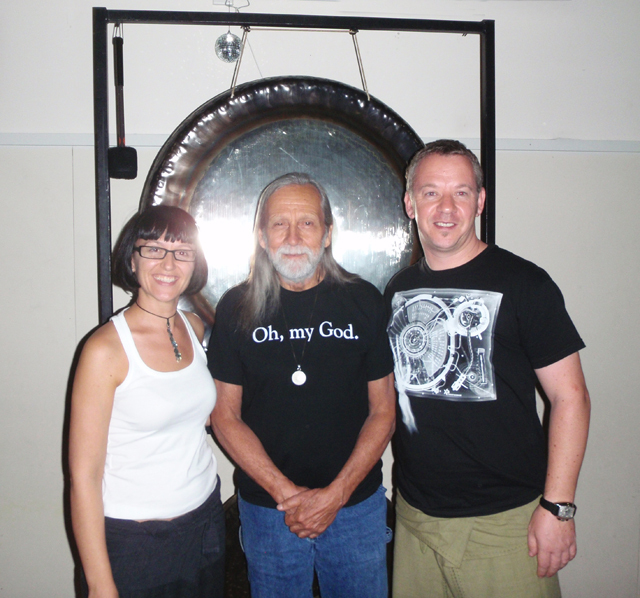 When we discovered the power of the gong, we were completely blown away! We were inspired to fully embrace it as a healing modality and introduce it’s magic along with the power of meditation to as many people as possible, especially those in mainstream society who are often the one’s who need to destress & heal. This is our unique way of raising vibrational frequency and global consciousness. Since 2008, we have gonged thousands of people on the Australian east coast through our large events and private 1 on 1 sessions, facilitating many transformational experiences with these amazing tools.